HYMN TO THE SUN, EARLY WORK! 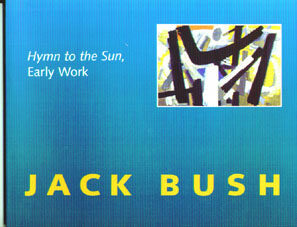 Michael used many avenues to research this tribute to Jack Bush. Terry, Robb and Jack Bush Jr. willingly provided important information and assistance to him. They also gave him their permission to access their father's diaries. These dairies were put in the Library and Archives of the Art Gallery of Ontario by the Bush family in 1987. There is an honest directness in Bush's attempts to simply paint out his feelings without regard to whether the work was saleable or even worthy of exhibition." This honest self-examination provided Bush not o nly with a deep well of symbols and motifs that would form the basis of his formal imagery, but it loosened the fetters of convention and the bindings of his ego to allow him greater insight into his unconscious and spiritual self. 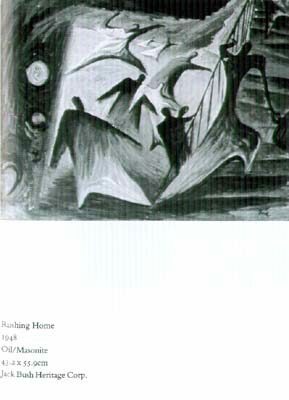 Some of the paintings, such as The Meeting (1947) and Rushinghome 1984), deal with the tensions and pressures of day-to-day existence and have an almost comical air. Other works like Broken Window (1950) are terrifying in their blunt portrayal of a fragmented self. In The Broken Window the "cubism" of open and closed doors and facets of broken and shattered glass point to a means by which Bush could externalize inner passions. Paintings of this sort are grounded in inner necessity, not a desire to investigate twentieth century artistic modes. 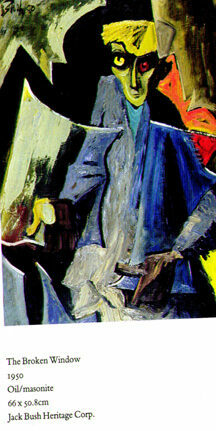 The second approach Bush used involved his depiction of religious themes. Bush's religious paintings are, perhaps, his most enigmatic. That Bush was very religious is well known. His parents were devout Anglicans, and stalwarts in St. Columbia's Church in Montreal. In particular, Bush's mother was a faithful Anglican as were her parents. Jack himself sought out St. Thomas Church on Huron St. in Toronto soon after he had arrived, and both he and Mabel were very much involved in the life of the church. Bush was a sidesman during the 1940's and took his family to church regularly. Both he and Mabel openly discussed sermons at the table and they even considered having Bible readings before dinner during Lent (an idea that was not particularly well-received by the sons). However, what Bush had kept discrete from most people was his "inclination" to the priesthood. In May, 1952, in conversation with Dr. Walters, he concludes: "It will be a great joy should I be able to find that I was not intended for the ministry." This "inclination" lay buried until his late thirties, when it re-emerged, perhaps as a response to the anxieties and tensions that were plaguing him. Further, that the inclination would take on a significant part of his development might have been foreshadowed by the images of churches that were prevalent in his work from 1944 to 1947. The religious theme emerges in 1947 in a very personal manner. However, Bush's work does not appear to be profoundly influenced by earlier painters who depicted religious themes. These religiously inspired works emerge from the same unconscious recess as his "mood" paintings and exhibit the same internal conflicts. Bush's theology was like his art, direct and honest. He was wary of esoteric and cult beliefs, although he was familiar with and sympathetic to Lawren Harris' theosophic writings and Jock MacDonald's mysticism. In 1953 he ventured to read a book on the life of Buddha, but his won beliefs sprang from within. Bush was later drawn to two literary figures that helped shed a great deal of light on his own spiritual evolution - James Joyce and Christopher Fry. Bush may have been introduced to Fry's dramatic works including The Lady's Not For Burning as early as 1949. Also, it is likely that on his visit to New York in 1950, Bush attended the production of Fry's Venus Observed, a play that he also read in 1952 to his great satisfaction. There are affinities in the images used by Fry and Bush, including fire, red sun, as well as doors and windows. More importantly, both artists shared a belief that human souls were at risk, principally because of the authority of organized religions. Both Fry and Bush believed in humanity's need for spiritual nourishment. Bush came eventually to see that the spiritual could be attained without the mediation of the church, Fry, a missionary's son, came to the realization sooner and incorporated it into his religious drama.